End strains to open pull tabs! 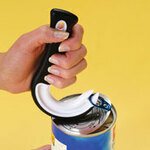 With this ring pull can opener's grip handle, the strength of your arm pulls tabs effortlessly. Keep nails and hands away from sharp edges. Opens any flip-top! Dishwasher safe ring can opener is 5"L.